As we approach the end of 2018 and focus on planning for both a new year and a new Congress, I would like to take a moment to reflect on the progress NAFSA has made to defend international students and scholars. Facing new international student enrollment declines and the harmful, anti-immigrant and anti-global policies and rhetoric from the Trump Administration, NAFSA launched a new campaign earlier this year. The goal of this multi-year campaign is to improve and strengthen key policy makers’ opinions and understanding of international students and scholars so that they defend them in times of crisis. Since that time, our NAFSA policy staff and member advocates from around the country have worked hard to share the benefits international students and scholars bring to our campuses and communities. Thanks to this impressive work, members of Congress from both political parties have increasingly acknowledged the negative headwinds international students and scholars currently face to study in the United States. At least 62 members of Congress have spoken out in defense of international students and scholars in the past year, sending a message that many leaders in the United States still value international education. NAFSA dedicated a webpage for important regulatory updates accessible from our home page. Our regulatory practice team continues to provide our members with important information about changes in the regulatory environment. Nine members of Congress tweeted their support for international students in 2018, including Republican Senator Portman (OH) and Democratic Senators Markey (MA), Feinstein (CA), Whitehouse (RI) and Representatives Quigley (IL-05), Bonamici (OR-01), Bustos (IL-17), Lujan Grisham (NM-01), and Peters (CA-25). Working in collaboration with international educators, the NAFSA Public Policy team has developed stories of nineteen international students & scholars from around the United States. Advocates share these stories with members of Congress via social media, in meetings on Capitol Hill, and in-district meetings to provide real-life, concrete examples of how international students and scholars contribute to the United States. You can view all of these stories on the NAFSA website. Rep. Colleen Hanabusa (D-HE-01) sent a letter to Commerce Secretary Wilbur Ross expressing concern over allegations that the U.S. Commercial Services had been directed to reduce its services for international education. This letter was signed by a total of fifteen Representatives. A letter spearheaded by Representatives Pramila Jayapal (D-WA-07) and Judy Chu (D-CA-27), sent to Secretary of State Mike Pompeo, expressed concerns regarding visa policy changes affecting Chinese students in certain STEM fields. This letter was signed by seventeen Representatives. Finally, a third letter written to Francis Cissna, Director of U.S. Citizen and Immigration Services (USCIS) was led by Senators Patty Murray (D-WA) and Dianne Feinstein (D-CA) and signed by eighteen Senators requested that he rescind the new unlawful presence policy that puts international students at risk. Additionally, a separate letter signed by nineteen Senators to Homeland Security Secretary Nielsen outlined the adverse side effects of the many negative immigration policies spearheaded by the Administration and specifically noted the decreasing international student enrollment. George Mason University President Dr. Angel Cabrera published an op-ed in The Washington Post on November 13, 2018: Make America welcoming to international students again. Finally, among the many articles written about the impact of the travel ban, Bennington College President Mariko Silver was published in Forbes on July 7, 2018 with a commentary on supporting international students given the impact of the travel ban: Travel Ban Hurts U.S. College Students Too. Join NAFSA’s campaign to defend international students and scholars by signing up on Connecting Our World. Join us for a conference call on Wednesday, January 9 at 2:00 pm EST to learn more about NAFSA’s campaign and what it means for you. Share a story of a successful international student or scholar. Register for NAFSA’s Advocacy Day to meet with your members of Congress and their staff in Washington, D.C.
Join the NAFSA Challenge by donating to support this important work. 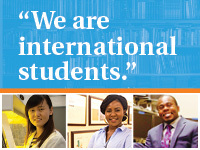 This time of year, I am grateful for the tireless work of our advocates to defend international students and scholars. I look forward to seeing what we can accomplish together in the new year. Esther D. Brimmer, DPhil, is the executive director and CEO of NAFSA: Association of International Educators.